So often we start a quilt to commemorate a new beginning; a baby, a wedding, graduation, etc. The quilt itself is a new beginning as well. It’s a new pattern, new fabric, a challenge you’ve not yet undertaken, and the end result is a piece of you. It’s a product of your own making; your time, your patience, your skill and love. What you have as a result of your efforts is material, concrete. Something you can hold in your hands, wrap yourself or a loved one in, and represents you and your love. So often I have started a quilt for a baby-to-be and imagined how this new life would change the world, or at least, my world. My first baby quilt was for my nephew some fourteen years ago. My sister’s little one would be the first grandchild born on my mother’s side. I had babysat a few neighbor kids, but this was my first “new baby”! My sister and I were in very different places in our lives. She was a college graduate, had been married a number of years by then and had a career. I was still in high school. It was my senior year. At my age, I had never been to a baby shower or had any idea what an undertaking adding a new life could be. I imagined what this new baby would mean to our family dynamic, how this new life would add to the family and how wonderful Christmas would be with a little one! I’m not sure why it would strike a 17 year old girl to make a quilt for a baby, rather than buy off of a registry, but that’s exactly what I did. I had it in my mind that this baby needed a quilt. And I needed to be the one to make it! Aww, look at that tiny machine! It so happened that I needed a Senior Project to graduate High School. I instantly knew that my quilt for baby would be my product and my research paper would be on quilting. As I sewed, I thought about this new baby, this new beginning. That wasn’t what my paper was about, but that was the lesson I took away. Many years later I made the same quilt for his sister, but in pinks instead of blues. I have made a number of baby blankets throughout the years, all for the welcoming of a New Beginning, two for my own children as well. I am currently at a precipice in my life right now, and am looking toward a New Beginning. I am not expecting a baby, but I am facing a major change. So, what’s the first thing I think of? Why, making a quilt of course!! I have a number of quilt kits. And by “a number”, I mean more than any reasonable person should have. And by “reasonable”, I mean “sane”. 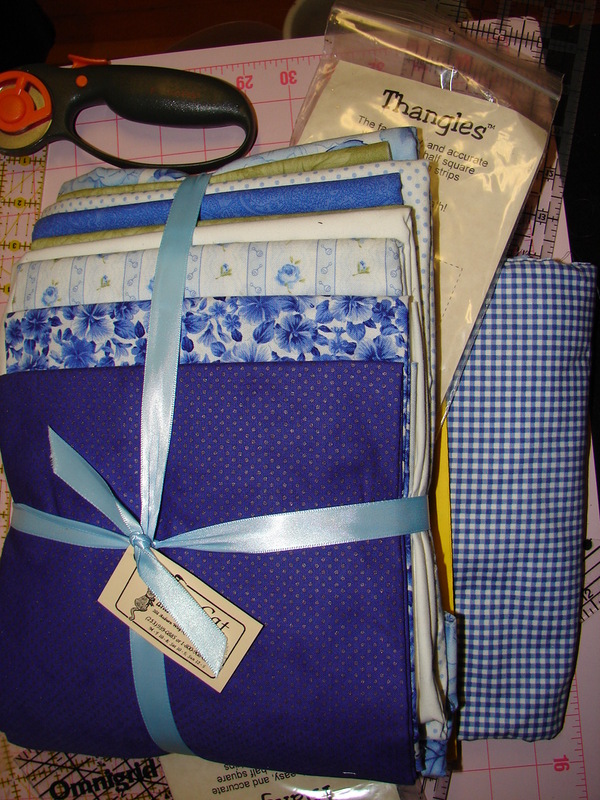 One of said quilt kits is a blue and white gingham based king sized quilt from Thangles Buck-a-block. (Blue gingham has always been a favorite of mine.) I had been participating the buck a block program at my local quilt shop, The Calico Cat, before they closed. While I was sad to see them close, I was able to get the finishing kit for my buck a block at a discount! As things happen, it has been sitting prettily under my desk for some time. I have decided that now is the time for this quilt. This will be my reemergence into the life I want to live. I will likely be moving July 1st, and intend to have this quilt completed as a housewarming gift to myself. I have only made one other king sized quilt (for myself), and it took me about a month to complete! Now that I have my deadline, I have a clear goal in mind. So, while this kit is not “new” to me, the project is. It will be the physical manifestation of my New Beginning. I look forward to the process, the undertaking and the symbolism it holds. I will always be able to see this blanket and remember this time in my life. Like a secret diary that only I can read. I will keep you updated on the process and completion. Wish me luck!! Lizze here. I wanted to share a link to Quilting Gallery, mostly for selfish reasons. 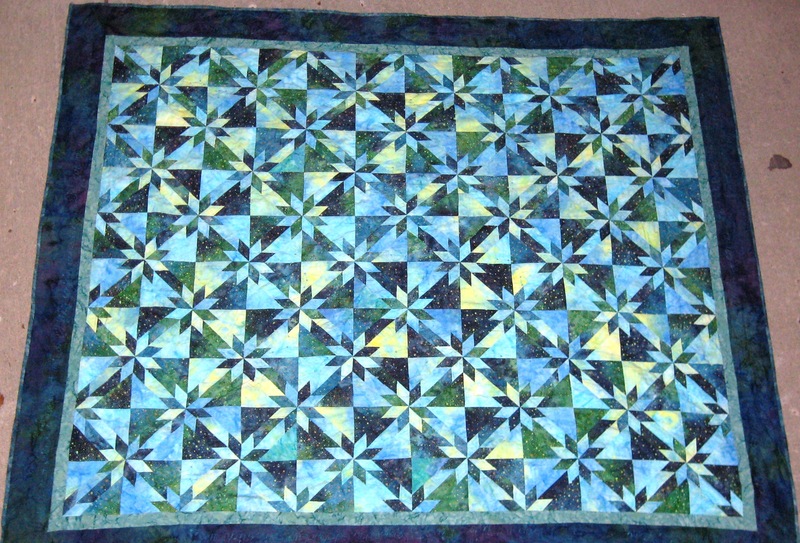 =) I have entered my favorite quilt into their Star Quilt Contest, it’s the one named “A Hunter’s Star”. This quilt is the one I challenged myself most with. 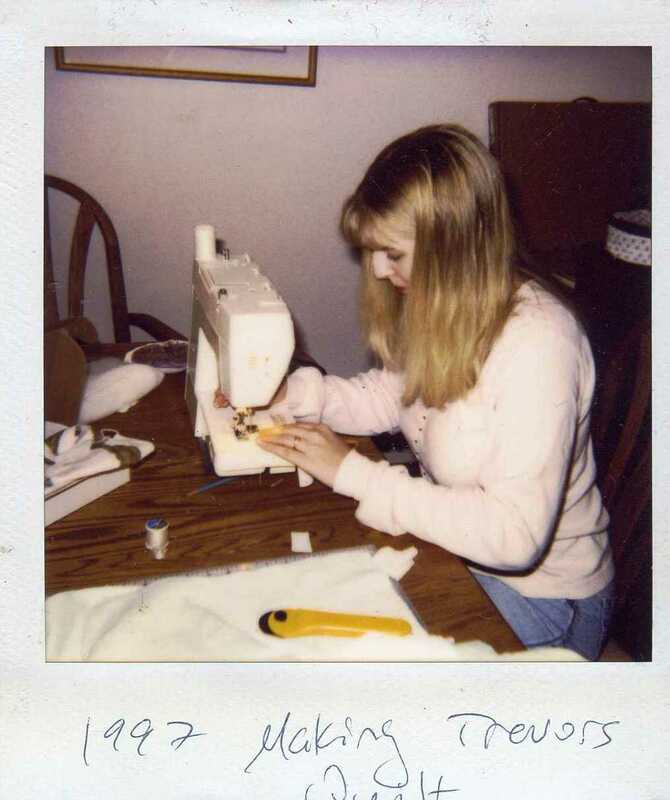 I had been searching for a pattern for a quilt I would make “one day”, and came across this one while at my mother’s. She has the Better Homes and Gardens, Quilter’s Favorites books. They are spiral bound and sent quarterly. They are gorgeous books with lots of very traditional patterns. I came across the Hunter’s Star pattern and just knew it was the one! Not only was it beautiful, but the significance of the title meant a lot to me. I asked to borrow the book and set off to find the perfect fabric. It is a two fabric quilt, and I didn’t think finding “the right fabric” would be difficult. The criteria I had was: Batik, blue and/or green, contrasting colors. I found two beautiful batiks that worked, kinda, but my heart didn’t leap when I saw them. They were going to have to do since I had committed to the purchase. I had to buy three or more yards of each color, so it was a bit pricey. The fabric sat on my table, uncut, for a few days. I was not anxious to start just yet. As it happened, I needed to take my mom to a quilt shop she had not yet been to to find her “perfect fabric” for a project, (The Quilt Barn in Puyallup) and there it was. They have an incredible selection of batiks, and after cruising the aisles, I found this… Now, I don’t know about you, but this fabric strikes me as the night’s sky. I fell in love, and I needed this fabric. Which of course meant I also needed a new coordinating fabric. This fabric spoke to me, it was “the one”. I bought it and started the project that night. What I was undertaking was more of a challenge that I expected it to be. Hundreds upon hundreds of pieces needed to be cut. Sewing on a 60 degree angle, pressing, matching points…but it was worth it. I had made something that I was proud of, and that I loved. It came together after the course of about a month, which is relatively quick considering the complexity of it for me. I was able to use some of the batiks I’d already purchased for borders. I’m kind of a border queen. I love adding the extra size and having a canvas for my quilting. 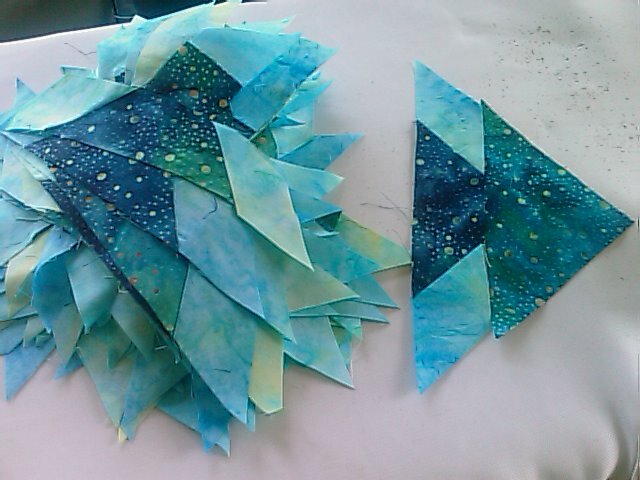 I knew I wanted to quilt constellations into the quilt, and I was very selective about the ones I chose. They all have a good story, or are significant in some way. I quilted them into some of the square blocks. I quilted a freestyle helix into the first border, and song lyrics into the outer border. I chose a variegated thread for my quilting so it would blend, yet also show up, if that makes sense. 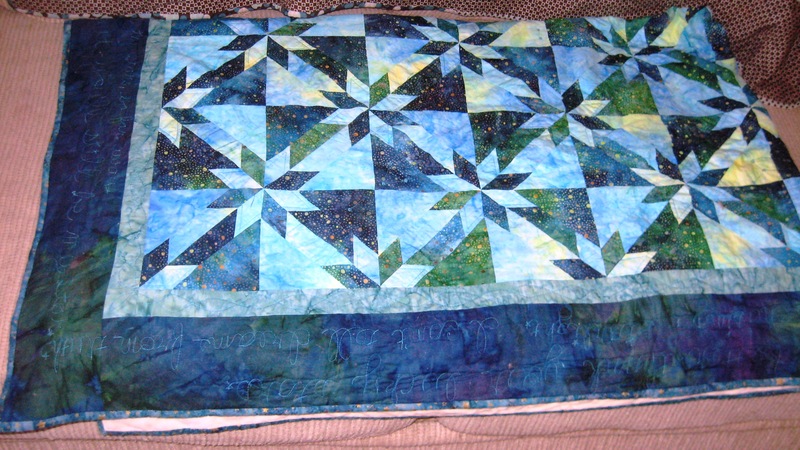 The outer border fabric is darker to highlight the quilting. The song lyrics I chose are from songs that are meaningful to me, and also star or sleep related (I like music, so it wasn’t hard to find lyrics. It was hard to choose which ones!) I chose 10 songs in all. The binding was another fantastic find. 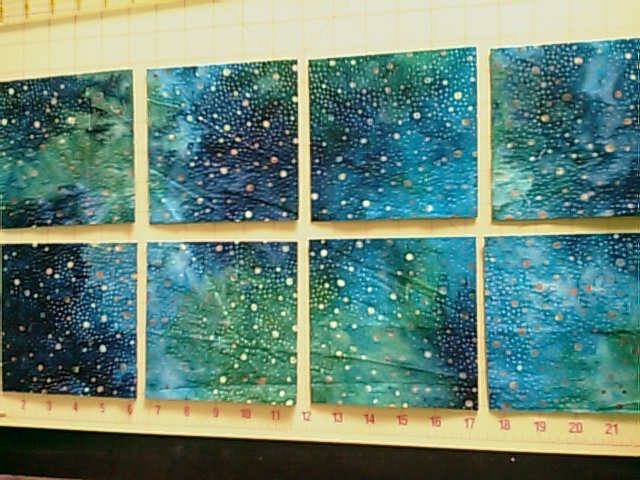 It is a blueish batik with gilded stars, and was perfect! As if I didn’t love this quilt enough, I backed it in Minkee. You know, the ultra plush, super soft fabric that makes you want to rub your face in it? That. Would you believe after all that, I gave it away? There is seldom a quilt I make that I don’t want to keep, but this one…*sigh* went to a good home. I know it is loved, and that is really all I can ask for. So, there you have it. You now know why I love this quilt, and I hope I have earned your vote for “Star Quilt”. Thanks for reading!